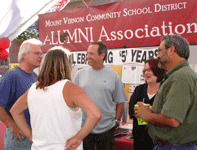 Find the All-Alumni and Community Reception Tent uptown Mount Vernon during Heritage Days on Friday and Saturday, next to the Bingo Tent. Come in to sit down, enjoy visiting with friends and new acquaintances, and enjoy the displays and yearbooks. Pick up this year's bottle of water personalized with faces of some alums you might know! 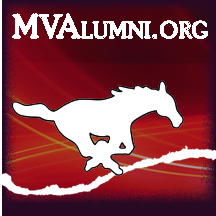 Alumni mustang pins, shirts, and cds-dvds on hand for sale. Exact hours of Reception Tent for Saturday to be determined.